STICK’EM UP, DIGGER! JP MORGAN ON TRIAL IN SYDNEY FOR DEMANDING $86 MILLION FROM CONSOLIDATED MINERALS AFTER LOSING TAKEOVER DEFENCE – AND THAT ISN’T COUNTING THE BIG MAC MEAL ON THE BANK TAB! In the business of boxing, a pugilist’s hands are not only his stock in trade, but weapons as potentially lethal for him to wield as a pistol is for a stickup man. If a boxer uses his fists outside the ring, he may have difficulty proving self-defence, while his adversary will have less trouble justifying having to shoot him. 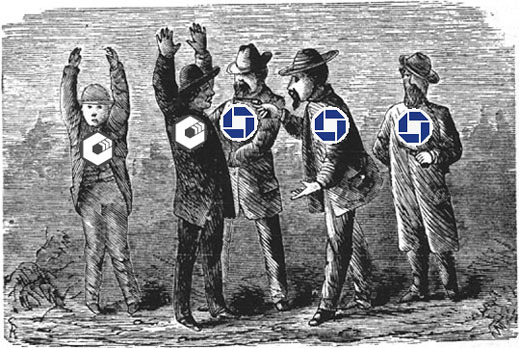 So in the business of banking, if a banker offers a mining company not money, but advice, what exactly is the service rendered, and what is the banker’s word worth? How dangerous might it be for the financial health of a business to take the advice, and who carries liability, especially if the banker doesn’t perform any other service except being on the losing side of a takeover bid? And what of the practice of bankers charging twice and three times over for the same advice, plus signing fees, monthly retainers, and personal expenses on top? and expenses, including $6.32 for a meal taken on a business trip somewhere outside Australia. Jon Gidney, JPM’s Sydney managing director, has intimated to his friends in the business media that it is never a pleasant feeling when your pay cheque is missing a few bucks. But Consolidated Minerals (Consmin) has responded with a cross-claim, charging JPM with implementing terms which were superseded by a telephone-call of July 2006 between senior executives of the two companies. Having verbally agreed then that the bank’s advisory fees would be capped at $7 million, and after having paid JPM $20 million in full and final settlement in February 2008, Consmin is now charging JPM, according to the court papers, with “unconscionable conduct within the meaning of Sect.51AC of the Trade Practices Act 1974”. In simple, Consmin, represented by the Gadens lawfirm, is accusing JPM of misleading or deceptive conduct in relation to the fee cap; double-and triple-charging for the same non-service in a losing takeover defence; and demanding money out of line with its practice with other clients. This has led to the application by Consmin for disclosure by JPMorgan of comparable fees it has charged other mining companies for takeover defences between June 2005 and June 2007. The judge’s order for production of these documents must be complied with before the court is scheduled to resume hearing the case in three months’ time. Publicly listed mining companies, with big free-floats, have rarely challenged bank advisory fees for IPO’s, mergers, and takeover defences. An obvious reason is that borrowers are loath to bite the hand that feeds them. But in this case, JP Morgan raised no money for Consmin, and in fact failed in the defence Consmin’s shareholders sought against takeover. The fierce competition between banks for clientele, and the rich pickings for the individual bankers, have combined to make detailed information about advisory mandates extremely rare. What has happened in this case is that JPM has pushed the sole owner of Consmin, Ukrainian magnate Gennady Bogolyubov (left figure), too far — $66 million too much, at a time when there is a global backlash against banker bonuses and bank fraud. Justice Patricia Bergin, the chief judge of the equity division of the NSW Supreme Court, has held one hearing so far, and scheduled the start of the trial on February 22, next year. A thick file of court pleadings describes the well-known contest for control of the Australian manganese miner by Brian Gilbertson’s Pallinghurst Resources and Bogolyubov’s vehicle, Palmary Enterprises. The contest for Consmin began in October 2006, when Pallinghurst offered a bid equivalent to $2.08 per share. The following April, Central African Mining & Exploration Co (CAMEC) made a confidential bid. This was followed by other bids from Territory Resources Ltd at $3.37, and Tinfos at $3.75. On August 31 of 2007, Bogolyubov’s Palmary made its offer at $3.95. But competing bids drove the price up to $5.00. At that point, in December of 2007, Pallinghurst threw in the towel, accepting Palmary’s offer for the stake Gilbertson had amassed of of Consmin. Palmary then took full control of Consmin; delisted the company; and was sent JPM’s invoice. The court papers show several calculations of the exact amount Gidney and his associates are now claiming. The amounts depend in turn on JPM’s estimate of how much the Consmin share price went up over original offer prices as the competitive bidding intensified. The fundamental principle of JPM’s claim is that it earned a share of this increment. But Palmary, says Consmin, had nothing to do with JPM; was separately advised by UBS; and was not introduced by JPM. Accordingly, Consmin is asking the judge to rule that JPM failed to provide the services for which it is now seeking to be paid; misrepresented what its fees for service would be prior to engagement; failed in the defence which it had advised; offered a contract which should be voided for uncertainty; and is not entitled to any success fee, because it didn’t earn it. Consmin’s defence also charges JPM with accepting a $20 million cheque, and banking it in February of 2008, with the clear understanding that it was a full and final settlement of its entire fee claim. JPM’s court filing sets out an elaborate structure of overlapping money-spinners. In the first place, it charged Consmin US$100,000 for the privilege of signing up the big-name bank. This payment was handed over promptly. Then JPM proposed a monthly retainer of $5,000 per month, which, according to the bank papers, is still outstanding. The commission and fee structure disclosed so far has four parts. What JPM is calling its “Base Defence Response Fee” amounted to 0.75% of transaction value “for advice in relation to an offer that proceeds to completion”; or 1% of the proposed transaction value “in the event the Company successfully defends an Offer”. Consmin is arguing this is payment for failure, which cannot be necessary, nor justified in reasonable and ethical business practice. If this looks like doubling and tripling the charge for the same banker’s advice, there is more. This is what Consmin executives are calling the pure greed levy. According to Consmin sources, the $20 million it offered and paid to JPM in February of 2008 was significantly more than the advisory fees Palmary paid UBS for their victory. The court argument is that by accepting and banking the cheque, JPM had agreed to a settlement of all claims. Instead, JPM has submitted its calculations for court award of the difference between the $20 million received, and its three fee estimates for the failed defence and Palmary success — $87 million, $57 million, $51 million. Broken down between JPM’s failed advice, and Palmary’s success on UBS advice, the court documents show that JPM is demanding $87 million for advising on the three unsuccessful takeover bids – Pallinghurst, Territory, Tinfos – or $57 million for Palmary’s success. The $99,228 aggregate of expenses invoiced by JPM are also revealing: international airfares of $21,744 and Australian domestic airfares of $48,144; telephone calls worth $3,764; Australian drinks and meals of $3,764; production and research charges of $167; and one international feeding of $6.32. This is equivalent to a Big Mac meal, comprising burger, medium fries, and milkshake. In its counter-claim, Consmin is demanding that JPM pay back $13 million of the $20 million it has received, if Justice Bergin rules that the $7 million fee cap discussed by the two sides is enforceable. JPM is denying that the fee cap was made by its executive. Consmin says that internal JPM documents to be examined at trial show that the bank estimated $5 million in fees for the original mandate. Consmin said it will not respond to questions about the court papers, and will not comment on the pending litigation until the matter is decided in court. 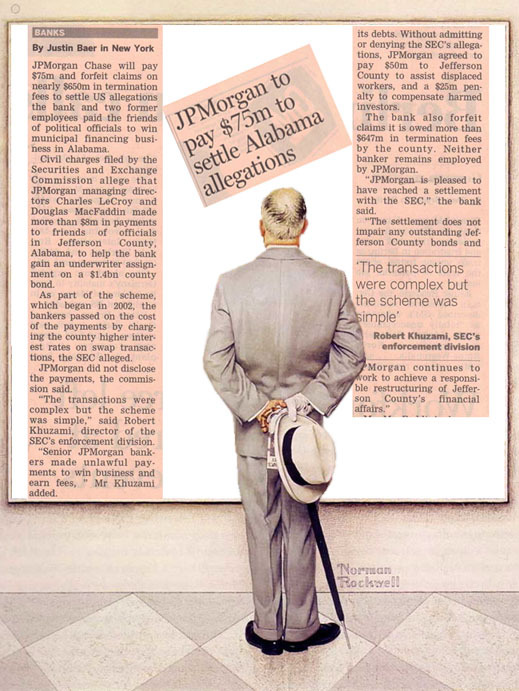 How JP Morgan arranged bribes for bond business; got public taxpayers to reimburse the bank for the cost of the bribes; and attempted to collect $650 million in “termination fees” when the art work was uncovered.